Stop me if you’ve heard this since the 2016 election: progressives flipped a Republican seat in Trump country. Wisconsin is the setting for the most recent rebuke to the Republican Party, and if you’re feeling déjà vu, no, I’m not talking about earlier this year when Wisconsin Senate District 10—held by the GOP since 2000—flipped to the Dems in a 26 point swing from election day 2016, and Wisconsin Governor Scott Walker took to Twitter afterwards to send a message to his conservative brethren. 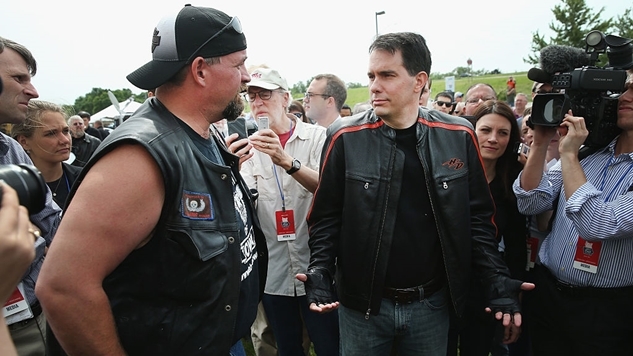 The new progressive victory in Wisconsin that I'm talking about came against a conservative judge with the backing of Governor Walker, the NRA and nearly a million dollars in ads from an anti-union lobby, resulting in another Twitter salvo by the governor. Judge Rebecca Dallet was elected to Wisconsin's State Supreme Court in a 56.5% to 43.5% victory. This narrows the conservative majority to 4 to 3 on the court, and it sets the stage for progressives to retake the court in the coming years. As Stephen Wolf of Daily Kos explained, this is a big deal, especially as it pertains to reversing extreme GOP gerrymandering. Such a majority could, in turn, act as a brake on the GOP's worst instincts, which they've acted upon repeatedly ever since gaining total control of state government in the 2010 wave. Walker and his Republican allies in the legislature began by passing extreme congressional and legislative gerrymanders that allowed them to easily maintain their majorities even though Democratic candidates won more votes in 2012. Republicans also implemented a new voter ID law, cut early voting and made it harder to register to vote. And meanwhile, what was the court's conservative majority up to? It was busy shutting down an investigation into political corruption in Walker's administration and letting judges refuse to recuse themselves in cases involving their own campaign donors. Judging by their behavior in the seat of power, the Republican Party does not believe in democracy, and Scott Walker's Wisconsin is proof. Not only does he run Wisconsin like a mafia don, but he refused to do his legal duty to the public because he knew the Republicans would lose as a result of it. Luckily, democracy still has plenty of fight left in it, and a judge appointed by Scott Walker emasculated his attorney in court and ordered the governor to fulfill his duty and call for special elections to fill these empty seats in the Wisconsin legislature. Off the heels of that defeat in court which he believes will lead to greater defeats, Walker reacted to last night's loss at the ballot by publicly entering the bargaining stage of grief. Big government special interests flooded Wisconsin with distorted facts & misinformation. Next, they'll target me and work to undo our bold reforms. We need to keep moving #WIForward & make sure a #BlueWave of outside special interest money doesn't take us backward. As I have done previously, I gathered all the generic ballot polls I could at this point in the midterm cycle since 1938, a far larger data set than is usually available for examining either special elections or primary turnout. Excluding 1970, for which we have no data, no majority party have ever trailed by more than 10 points on the generic ballot at this point in the cycle. The only other time a party has ever faced a 10-point deficit at any point on the generic Congressional ballot? The 2006 Republican class that got booted out in record numbers after dissatisfaction with a clueless Republican president clearly in over his head boiled over. Sound familiar? Enten predicts that it will take about a seven point victory for Democrats to retake the House, which is just under where the slightly less rosy FiveThirtyEight and RealClearPolitics averages land. It sure seems like the Democrats have at minimum, an above average chance to retake the House in November. And if we’re going by the swings in (very low turnout) special elections, the GOP should be fearful of losing the Senate too. A Kentucky district swung 86 points from 2016. Sure, the Republican candidate was the wife of a congressman who killed himself after being outed for sexually assaulting a 17-year old girl at the church he ran, but still, Trump won this district by 50 points and the GOP couldn’t hold on to it for one election cycle. Democrats flipped a seat in Missouri by 31 points in a little over a year after the election. Donald Trump has revealed the true face of the Republican Party, and people are showing up to the polls in droves to push back against this rotten ideology. Make sure you’re one of them this November, and in any other elections that take place in your district at any point during the year. Democracy is a team sport, and the GOP knows they cannot win that way, which is why they aim to restrict it at every turn.